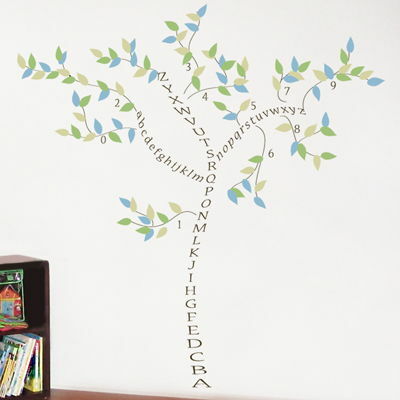 This adorable tree wall decal is made up of the entire alphabet! We designed this tree decal with a full set of CAPITAL letters, a full set of lowercase letters, and even numbers 0-9! Our tree is shown here in our Extra Large size in dark brown matte, with ice blue matte, buttercream matte, and pale sage matte leaves, but it is available in the colors and size of your choice! 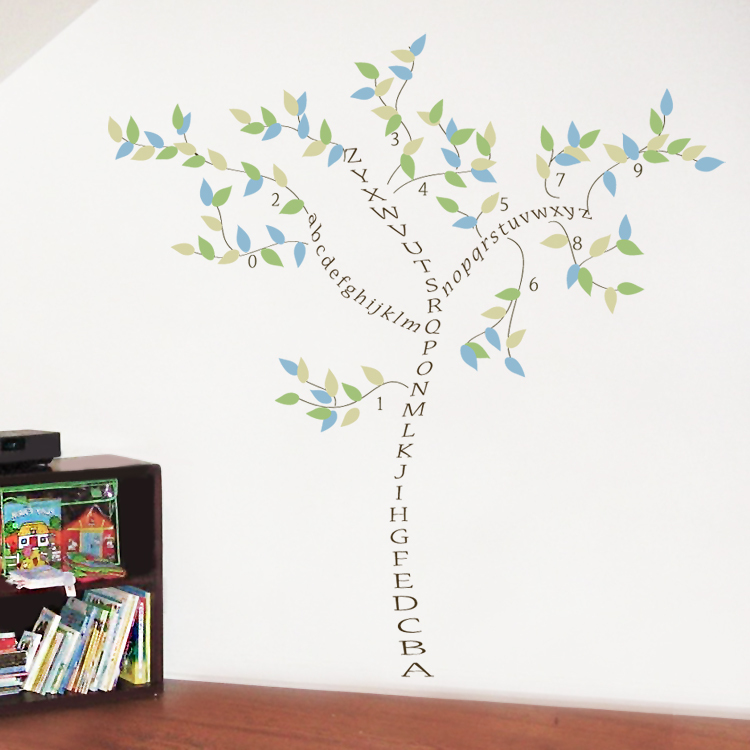 Our Extra Large sized Alphabet Tree wall decal measures 96 inches high (that's 8 feet high!) by 96" wide. It comes in sections for easier application, and to allow for your own creativity! You will receive a total of 150 leaves, in your choice of three colors, to place however you like! These are awesome! They look great in the room and were really easy to put up. The service was fantastic and I got them in the mail a few days after I bought them. Easy, simple, and great customer service. Thanks! I've got a problem with the decals I recently ordered. Everybody who now walks down the hallway keeps distracting me by commenting on how nice the are and keep talking about getting some for themselves! ;) Very nice work. I love them and your customer service was great as well. Thank you so much, looking forward to working with you again the future. I just wanted to share a picture with you all...while my original intention was to use your large infinity symbol decal on our handmade wedding "guest book" it didn't quite work out that way. The decal didn't adhere totally flat due to the wood being uneven so I decided to use the decal as a stencil! However, the names did lay flat, but they just weren't the right color for the project. So after a 10 minute chat with an incredibly helpful Dali employee I had new name decals special ordered! Just wanted to thank you for always taking care of your customers! Now, my husband and I are working on placing your Robot decals in our baby's nursery....so more pictures to come!